Posted on Tue, Jul 13, 2010 : 2:42 p.m.
Michigan basketball coach John Beilein wasn't initially thrilled with expanding the NCAA Tournament, but he he can live with the format announced on Monday. (AnnArbor.com file photo). John Beilein has always been an if-it's-not-broken-don't-fix-it guy. So when he sat in a National Association of Basketball Coaches meeting at the Final Four in April and the topic of expanding the NCAA Tournament came up, the Michigan men's basketball coach wasn't crazy about the idea. To him, March Madness remains the greatest spectacle in sports and to change it would lessen its appeal. But a day after the NCAA announced how it will structure a tournament field that will include 68 teams beginning next year, Beilein said he is OK with a system that adds excitement to the national tournament. The NCAA will use a First Four format, taking the tournament's lowest seeds with the winners advancing on to meet top seeds. Two games will involve the lowest at-large bids, meaning that teams from the nation's power conferences - such as the ACC, Big East or Big Ten - could play two days after Selection Sunday. For Beilein, who has twice found his teams - first at Richmond and then at West Virginia - counted among the first four teams not included in the tournament field, the new system is a good compromise. "If you're one of those last few in, it's a very exciting week," Beilein said in a phone interview Tuesday. "I think there's so much a flip of the coin there at the end, and if there are four teams on the board, how do you pick one team? There's no science to that one. "Now, there's still the who is the fifth or sixth team that we're not going to take in, but I think it's a happy medium between the at-large and the automatic bids." 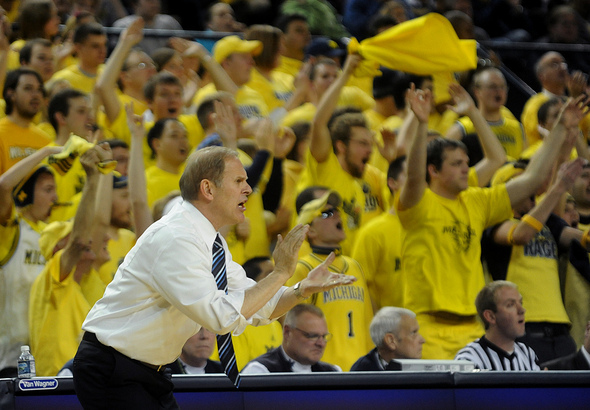 Beilein has taken four schools to the NCAA Tournament, including Michigan in 2009. The Wolverines snapped an 11-year tournament drought, earning a No. 10 seed and beating Clemson in the first round before seeing its run end against Oklahoma. Beilein felt allowing 96 teams into the tournament was too many, but that the new format buys the NCAA some time. While this may be the first step in tournament expansion, the First Four set-up will serve as an experiment. Beilein said it's too early to tell if the 68-team format will water down the tournament's mass appeal, but for now, he's excited to see how things play out. "It is always such a tremendous tournament and such a huge part of the NCAA revenue stream and always (generated) so much interest in college basketball," Beilein said. "But if this now allows a few more teams to be included in it, I'm all for it. And if you're on the bubble, it beats the alternative. "This way, if you win (in the first game) you play again and if you win, you play again, and I think that's exciting." Jeff Arnold covers sports for AnnArbor.com and can be reached at (734) 623-2554 or by email at jeffarnold@annarbor.com. Follow him on Twitter @jeffreyparnold. Tue, Jul 13, 2010 : 7:10 p.m.